April 21, 2013: Happy 38th anniversary to Blue Max CC, who celebrated this weekend by hosting the Central Plains LeatherSIR Leatherboy contest. 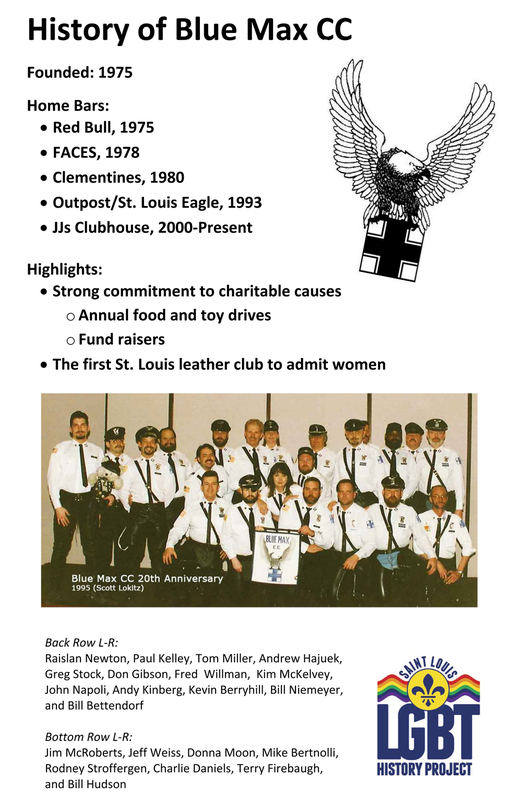 Founded in 1975, the club has a history of contributing to charitable causes, and was the first leather club in St. Louis to admit women. Over the years, the club has called the Red Bull, FACES, Clementines, Outpost/St. Louis Eagle, and JJs Clubhouse home. Blue Max CC has recently provided the Project with access to its historical archives and we will be scanning hundreds of items for future research. The Project was happy to provided display boards to document the club's history for contest guests to view. If your St. Louis area club or organization has a special event coming up, please let the Project know so we can possibly help you celebrate with a historical display. April 18, 2003: Last week, the Project received a generous donation of materials from Ramona Boston. Ramona donated a very large trunk filled with lesbian-themed items including books and magazines, along with local Pride memorabilia. Do you have St. Louis-focused LGBT history treasures to donate? Let us know. Thanks again to Ramona for her support. April 12, 2013: The Project is pleased to announce a new addition to our historical archives - a more detailed look at our first Pride. For three years now, James Andris has been researching St. Louis' first official Pride event, which took place April 12-20, 1980. He has researched the roots of this event that includes information about activities that were held prior to 1980, and the inner workings of the Magnolia Committee, credited for putting together the first event. Andris' research included interviewing five people who were heavily involved in the first event's planning (John Hilgeman, Cea Hearth/Glenda Dilley, Bill Spicer, Frank Sprayberry, and Jim Thomas). 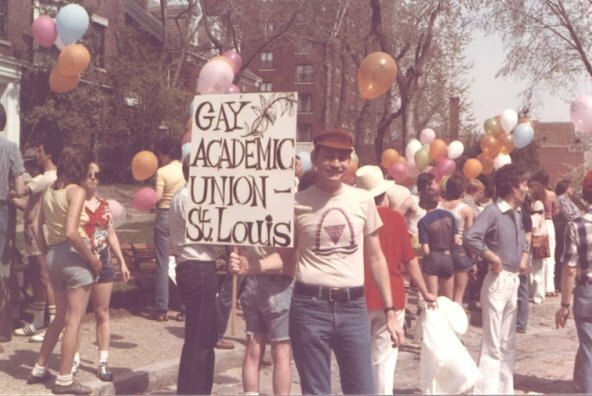 Jim, a Professor Emeritus of Education at Southern Illinois University-Edwardsville, attended the 1980 event as President of the Gay Academic Union-St. Louis. In addition to the extensive interviews, Andris donated several of his own previously written articles, along with artifacts associated with St. Louis' first Pride to the Project's archives housed at the State Historical Society of Missouri (St. Louis Research Center at UM-St. Louis). The Project thanks Jim for his hard work and efforts to preserve and promote our history. Pictured: James Andris, April 1980, St. Louis' First Pride. April 1, 2013: Please join the St. Louis LGBT History Project as we get ready for PrideFest 2013. The Project is planning a new exhibit to showcase our diverse and dynamic LGBT history. We will be needing volunteers to help staff the exhibit, as well as financial and/or pro bono donations to help us with display development, printing, and framing. If you want to get involved, please let us know. We will be hosting a "Project" PrideFest 2013 volunteer training session in May.